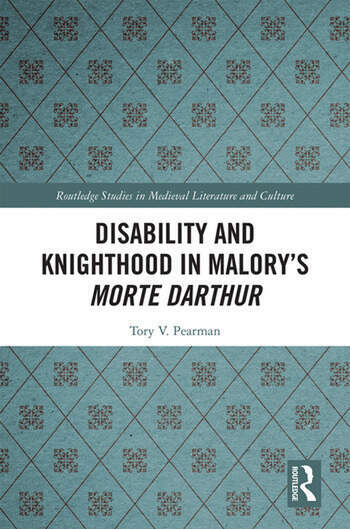 This book considers the representation of disability and knighthood in Malory’s Morte Darthur. The study asserts that Malory’s unique definition of knighthood, which emphasizes the unstable nature of the knight’s physical body and the body of chivalry to which he belongs, depends upon disability. As a result, a knight must perpetually oscillate between disability and ability in order to maintain his status. The knights’ movement between disability and ability is also essential to the project of Malory’s book, as well as its narrative structure, as it reflects the text’s fixation on and alternation between the wholeness and fragmentation of physical and social bodies. Disability in its many forms undergirds the book, helping to cohere the text’s multiple and sometimes disparate chapters into the "hoole book" that Malory envisions. The Morte, thus, construes disability as an as an ambiguous, even liminal state that threatens even as it shores up the cohesive notion of knighthood the text endorses. Chapter 1: "Disability, Lovesickness, and the Chivalric Code: Women Healers and Harmers in the Morte"
Chapter 2: "‘For whome he wente oute of hys minde’: Women and the Love-madness of Tristram and Lancelot"
Chapter 3: "(Dis)abling Heteronormativity: The Touch of the Queer/Crip in Malory’s Morte"
Chapter 4: "Vessels of Blood: (Dis)abled Bodies and the Grail in Malory’s ‘Tale of the Sankgreal’"
Tory V. Pearman, Associate Professor of English at Miami University Hamilton, earned her M.A. at Purdue University and her Ph.D. from Loyola University. She has published widely on the intersections between gender and disability in medieval literature. She is author of Women and Disability in Medieval Literature (2010).